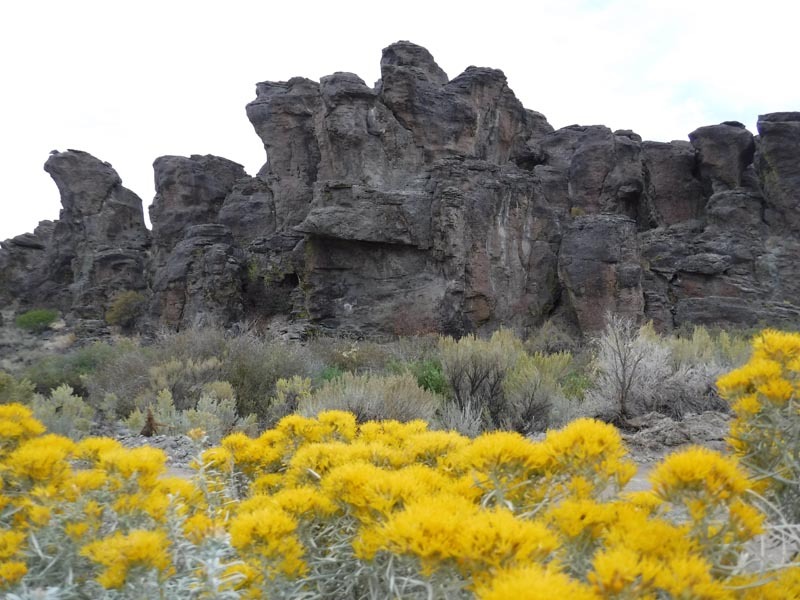 There was a hole in the southwest Idaho ride calendar with the long-established Owyhee Canyonlands no longer leaving tracks across the Owyhee Desert. Lynn White and Jessica Huber as co-ride managers stepped up to fill that gap over the weekend of September 28-30 with the Autumn Sun Pioneer, near Gooding, Idaho. Lynn White took it on because she likes and knows the trails in that area. (She had put on a nearby 2-day ride a couple of years ago.) First-time ride manager Jessica Huber took it on because, as she said, "I'm twisted! I love it!" 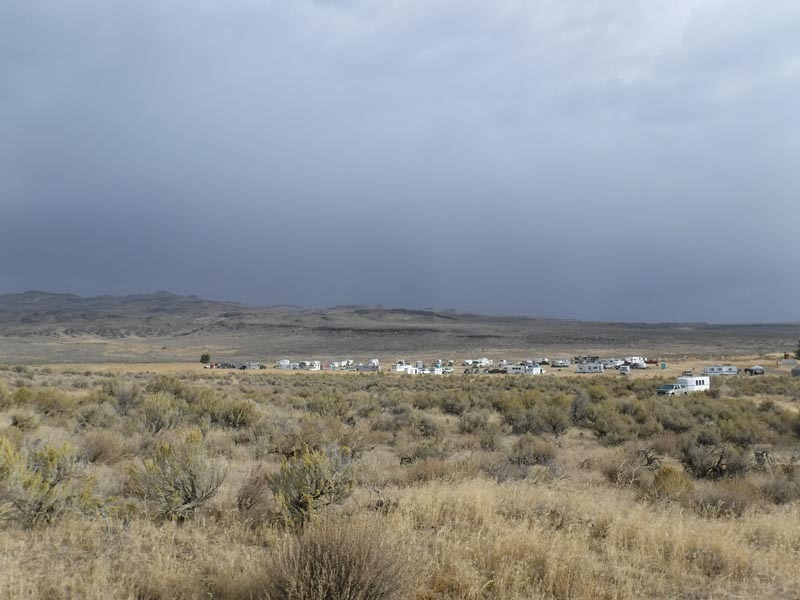 A big blow came when private land owners, who'd agreed to provide a nice, convenient base camp, suddenly announced a tripling in their camping prices, just 2 months before the ride. 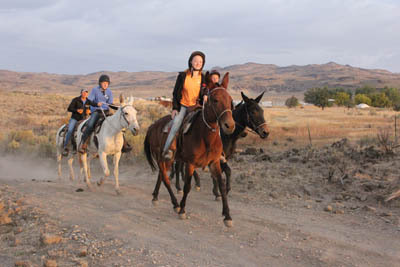 New private land owners Pat and Colleen Lockwood stepped in and saved the day (and the ride) by offering their space (bringing tears of gratitude), and Ridecampers had a great little field on an old homestead, tucked at the base of the Bennett Hills. A good turnout contributed to the success of this inaugural 3-day ride, with riders from near, and from as far away as Alberta, Canada (the Wadeys!). 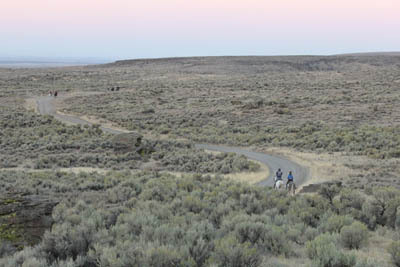 Trails wound through the sagebrush desert and up an into the nearby Bennett Hills, highlighted by a special hoodoo-filled canyon - the wind-carved monoliths made of tuff created by volcanic ash fall (and hereafter named Mad Cow Canyon, at the top of which is hereafter named Mad Cow Junction). So called because the morning of Day 1 I was up there waiting to photograph the 23 riders on the 50 miler and the 16 riders on the 25. Which I started to do. Now bear in mind this was the weekend cowboys were starting to round up their cows for the winter and push them out of the hills. 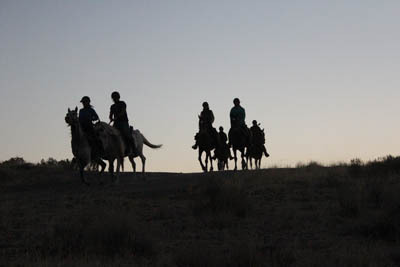 I didn't see any cowboys, but I did see a few calves heading up the canyon between riders, and taking a right turn down the road towards civilization. And then there was this cow: a she-devil psycho bovine. She appeared heading up the road towards me… and when she saw me from 30 feet away, she just sprouted devil horns and CHARGED me. I turned to run, and tripped and fell and that's what saved me. Instead of crashing into me, she ran right over the top of me… as I was buried into the ground all I could think of was, "$h*t! My cameras! I have to shoot this ride!" I tried to hold them up while crouching into a tight ball and covering my head and neck. I felt her on top of me for a second, then laid motionless a few more seconds, until a rider said she was gone - halfway up the draw headed for Montana. "It was deliberate!" said Carlene Benson, who saw it happen. I was skinned up and still stunned, but had riders coming up the road to shoot! Sadly I found that my best long lens (that I shoot 80% of my pictures with) was broke and had sagebrush stems sticking out of its innards. 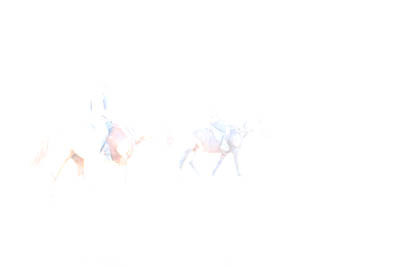 After shooting the rest of the riders with my second camera and smaller lens (which was dusted up but hopefully fine)… I found that Mad Cow had knocked the settings on that camera, so all those photos were overexposed and useless! So I did what any stunned, bleeding, endurance photographer would do… I sat there a couple more hours waiting for both distances to come back by me so I could get pictures of them all. I didn't want to wash off the wounds anyway, that would just hurt. By the time everybody rode back by me, they all knew the Mad Cow story, and several people had helpfully taken pictures of cows they'd encountered on the trails, searching for the errant beast. Sure I was still aching, but the most important thing was that everybody got their picture taken! 13 finished the LD, with Montanans Bill Miller aboard Raffons Noble Dancer (Sadie) and David Brown on Tezeros Hot Shot taking the two top spots, in 3:54 and 3:58. Sadie got Best Condition. Junior rider Jacelyn Butler finished her first LD ever in 5th place aboard Fletch, and she is addicted to endurance! 19 finished the 50. In a major endurance rally, Jessica and The Big Brass won the ride by a length over Mike Cobbley and Taladega (who last year had his own comeback with a bad brush with colic). After an uncooperative gall bladder that knocked Jessica out part of the year, and two pulls for Brass, they deserved that win, in a ride time of 6:36. 3 intrepid riders completed the 50 Cavalry style. That's where you get no assistance from anybody else - nobody can hold or feed your horse, and you have to carry everything you need with you, including horse feed. Hay and water are provided at vet checks. 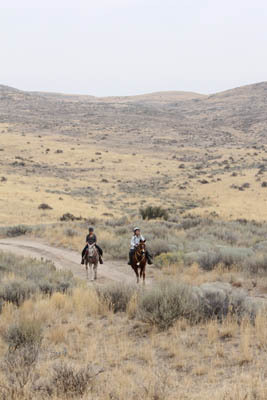 But if you need to stop to attend to nature's calling, you have to tie your horse to a sagebrush or hold onto him. Cavalry style can be a hard way to ride, if you're addicted to Gummi Bears and always need to have a big bag available, one that wouldn't fit in saddle bags. Day 2 ran smoothly with no Mad Cow events to report. Trinity Jackson's racing mules and kids showed up for the weekend, always a popular sight to see. 10 started the 30 miler, with just 5 finishing, because the 5 mule riders accidentally missed a turn on the trail and ended up back in camp, instead of the out vet check. They all stopped with Rider Option pulls, but a good time was had by all, because it's great fun riding those (most always) well-trained mules, and watching those kids ride the mules. Beth Skaggs and Flashbykish (Sparrow) won the ride in 6:02, by just a couple of minutes over Terry Doyle and Benny. Sparrow won Best Condition. 9 started the 55-mile ride with 7 finishing. It was a 4-way tie for first, with Nance Worman and Second Chance Fance, Chris Samson and Belesema Anna, Sally Tarbet and Orlabiban, and Anna McNamer and Badacz SM finishing in 10:08. Finishing next to tail end in 12:10 was another comeback of sorts, Debbie Grose and Jack. They hadn't done a ride since June, after Debbie broke her arm back in July. She was here riding with an arm cast. I wonder if her doctor knew about this? We always talk our doctors into letting us "ride horses" too soon after an injury. We get away with that by never explaining what kind of riding we do. 18 started Day 3's 25-mile ride with all but one finishing. The Junior mule riders (and sponsor Trinity) all took the top spots, with Baylee Morgan and Rusty pulsing down first in 3:33. 7th place Bill Miller and Raffons Noble Dancer took Best Condition. Beth Skaggs finished next to last on her 21-year-old Sparrow… the only LD rider to finish all 3 days. 12 started the 50-miler with 11 finishing, and a 3-way tie for first with Jessica Cobbley and The Big Brass, Lauren Coziah and Taladega, and Simone Mauhl and Boogie in 6:17. Boogie took the Best Condition award. That was his fifth BC of the year. Nance Worman and Fancy, and Canadian Robyn Wadey and DSF Saskatchewan (Chewie) were the 2 horse/rider combinations to finish all 3 days. Stay tuned for next year, because Jessica has even more ambitious plans, including better trails (BLM required her to use and flag only 2-track roads this year; she's certain she can work on amending that), and an Idaho challenge along the lines of Nevada's NASTR's Triple Crown… but I'll let her tell about that. Just watch out for a Crazy She Devil Cow, whose legend will live on though she's probably in the Canada by now because she was was on a beeline north.